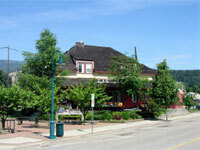 Railway (CPR) Museum is housed in a 99 year old station, one of the best preserved in the province. Once inside you can envision the hustle and bustle of the passengers boarding the trains. The station agent’s residence on the upper floor provides you with a wonderful sensation of the early 1900’s. The newspaper archives will give you hours of enjoyment. The beautifully landscaped area around the front of the station is a wonderful spot to rest with accessible parking to the downtown shops. In 1887 the CPR completed the rail link between Nelson and Robson – across the Columbia from Castlegar. Paddle wheelers, including the SS Minto, carried goods and passengers between Revelstoke at the head of the Arrow Lakes and Robson. Lead-zinc ore (galena) was barged across the river to West Robson and then shipped by standard gauge Columbia and Western Railway to the smelter in Trail. A little later the CPR bought the existing area railways as a part of the Crow’s Nest Line and linked them with a bridge near Pass Creek. At about the same time a line was built from West Robson to Midway. To accommodate the traffic the bridge and the station were both built and completed in 1902. 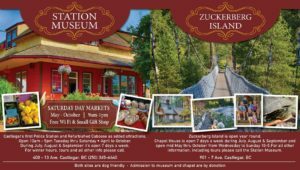 While the bridge has a swing span to accommodate downstream paddle wheelers, it was used only once. 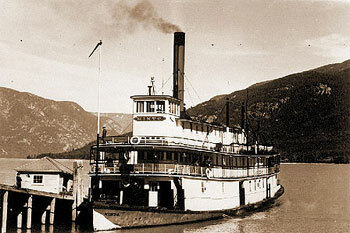 Above: A sister ship to the SS Moyie, the SS Minto, was the most famous of the Arrow Lakes stern wheelers and ran between Arrowhead and Robson for over half a century. The last steamer on the route, it was burned in 1968. Built in the wye of the tracks, the station had a second storey with living quarters for the station agent and his family.The first station burned to the ground in the late winter of 1906 as Station Agent Harry Gage and his family escaped with only their night clothes and one mattress in which Mrs. Gage had hidden the family savings. It was immediately replaced by the present station. 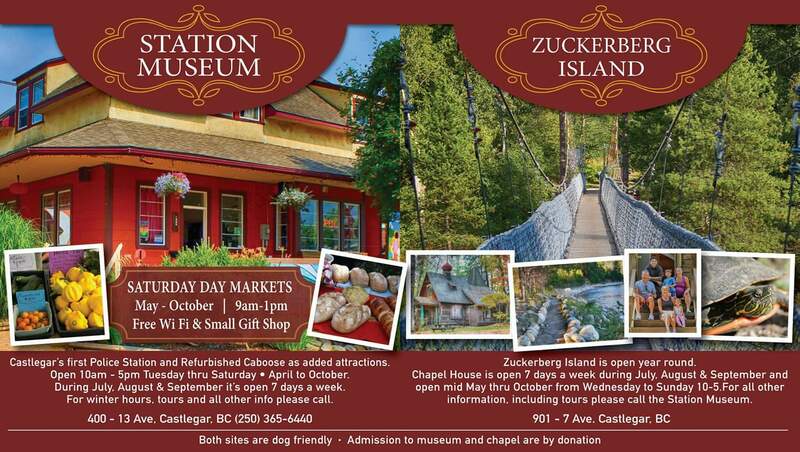 After almost 100 years it is still one of the best preserved in the province.